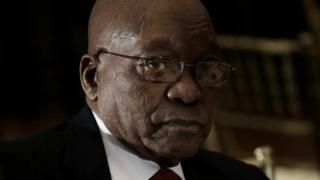 South African President Jacob Zuma don call im cabinet ministers to meeting for Cape Town on Tuesday, according to tori wey local station eNCA report. Dis na as pressure dey build on top di head of di 75-year-old leader to comot. Zuma dey normally hold cabinet meeting on Wednesday. Government no say anything for why Zuma call dis meeting when im for wait till tomorrow. But Zuma spokesperson Bongani Ngqulunga don come out say di president just dey chair normal cabinet committee meeting and no be "special cabinet meeting" like di way local media don report am. Ngqulunga say full cabinet meeting go happen next Wednesday, as im try to quench rumour say di president dey call di meeting to discuss im future with im ministers. South Africa ruling African National Congress (ANC) bin arrange special meeting for dia executive to happen on Wednesday 7 January, wey many dey expect say na when Zuma go resign. Zuma presidency don get plenty accusation of corruption and economy wey no dey grow, and im no fit get mouth like before now wey ANC don replace am as party leader with Deputy President Cyril Ramaphosa for December. No be today dem don try to comot Zuma as president. Wetin dey different dis time be say people wey want make im comot before im second tenure end next year don plenty.